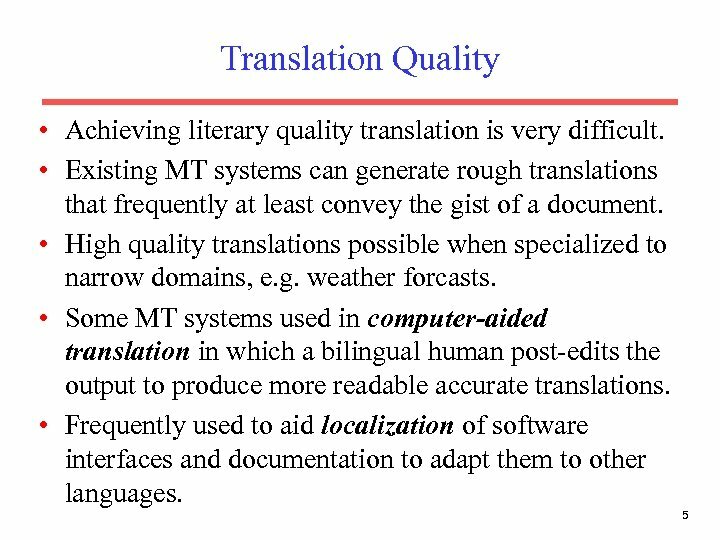 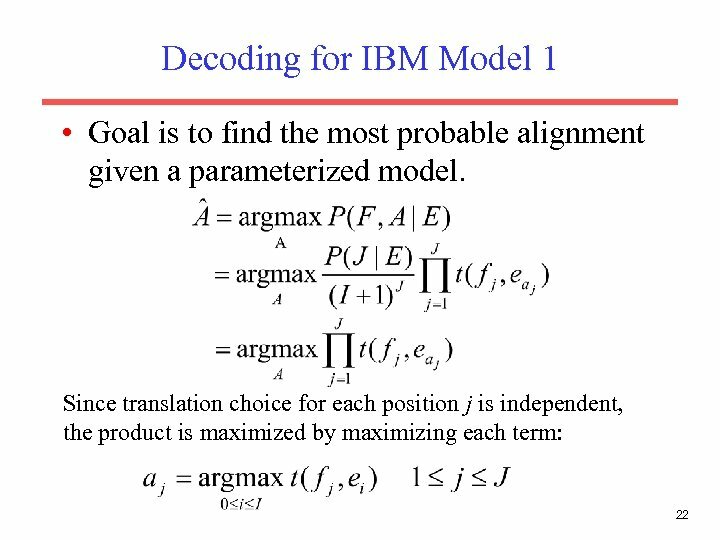 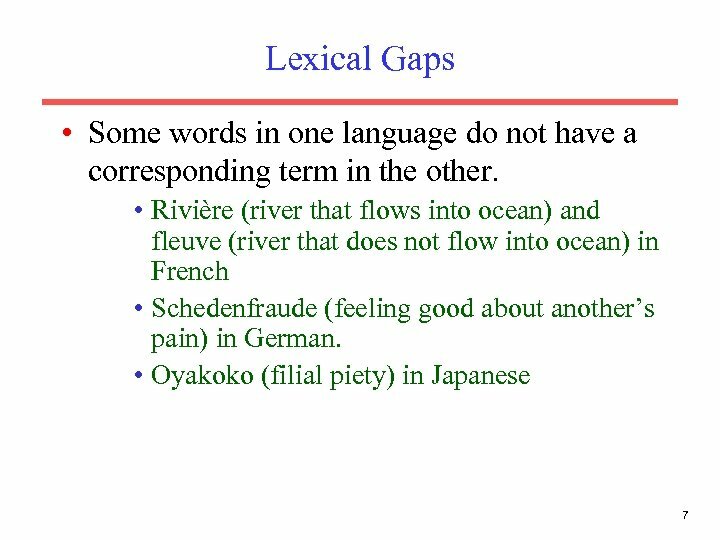 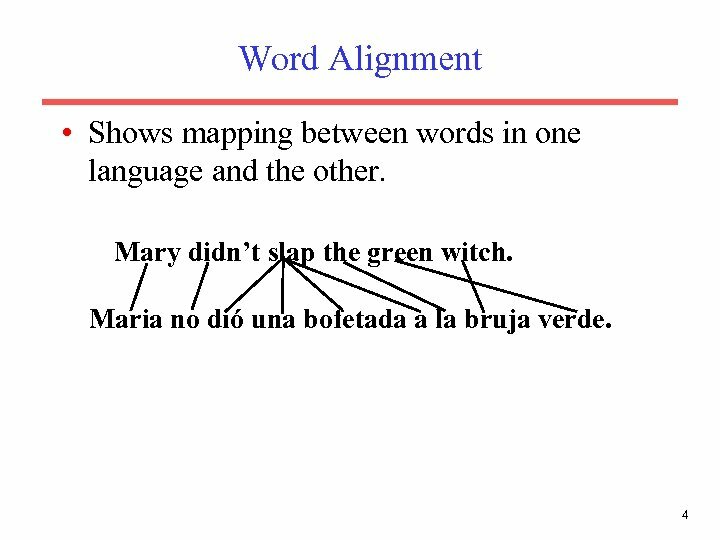 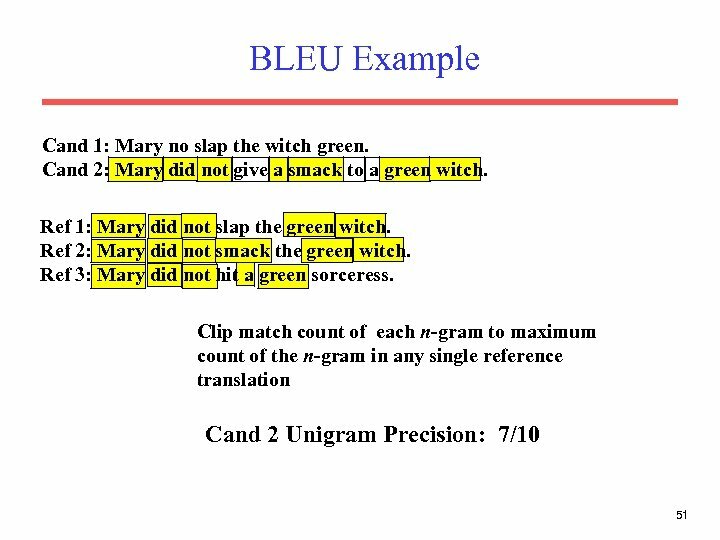 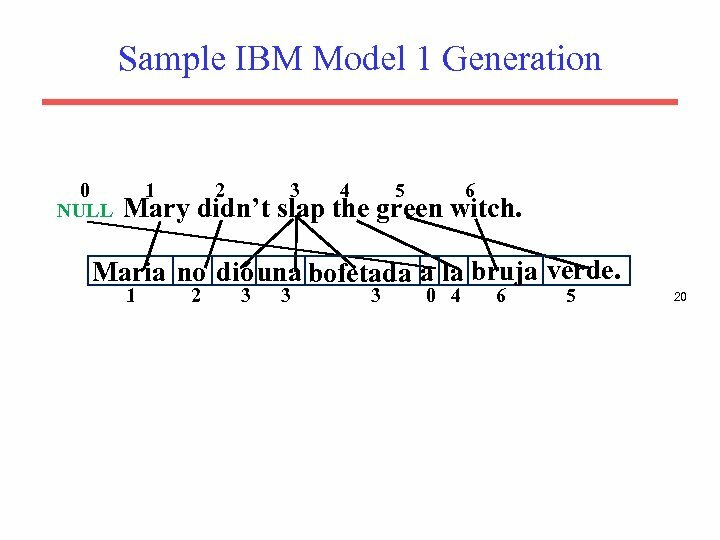 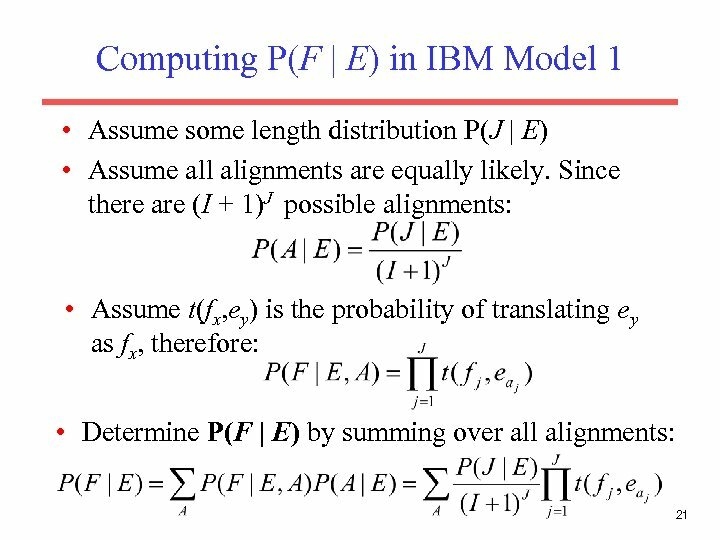 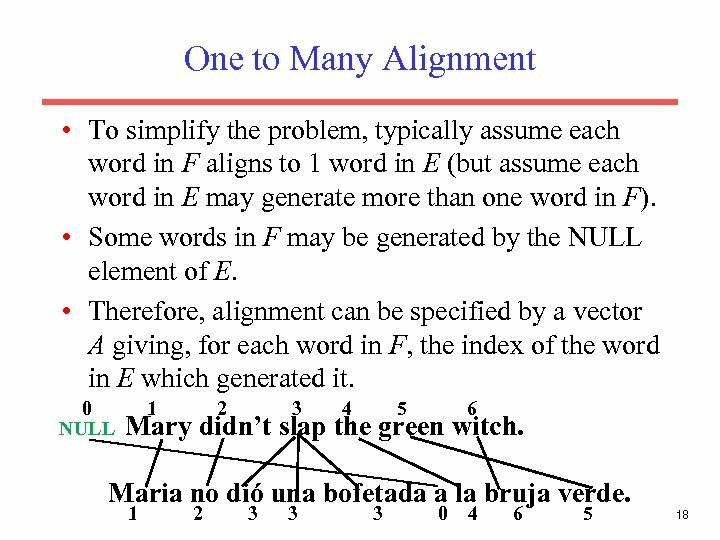 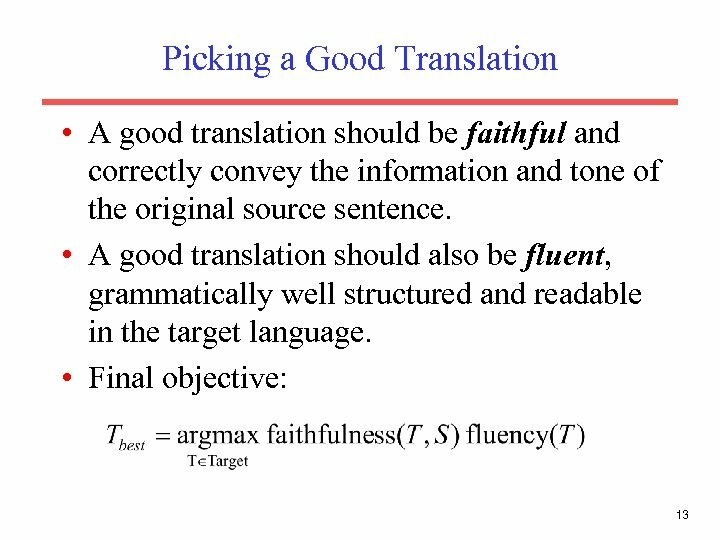 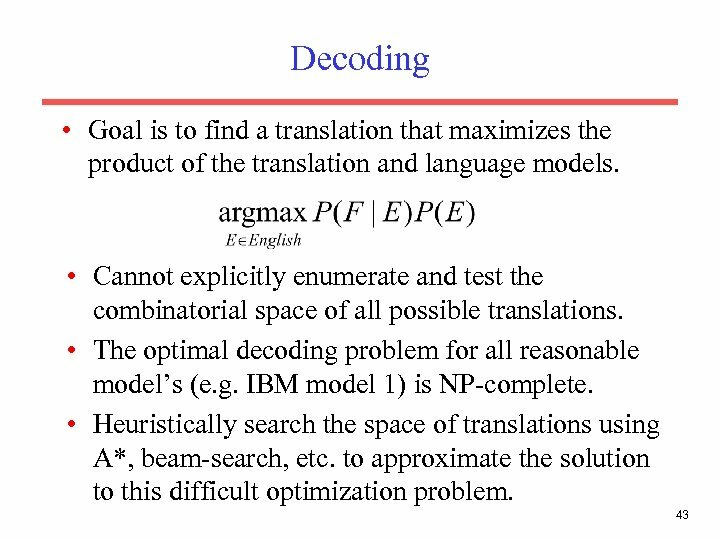 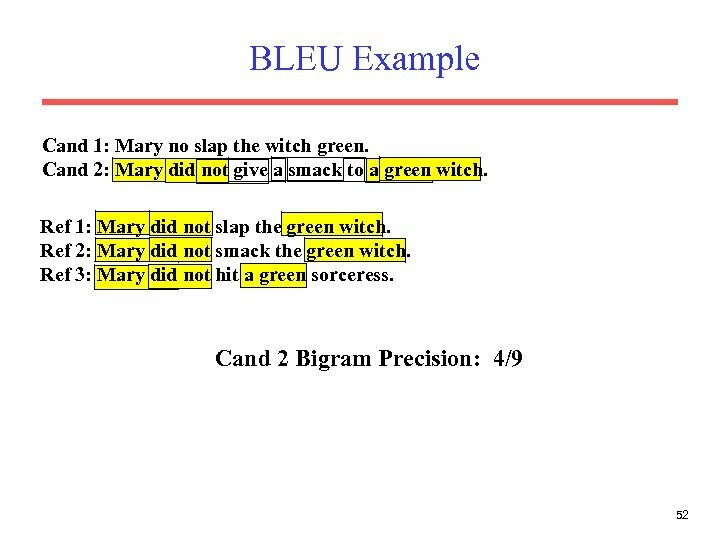 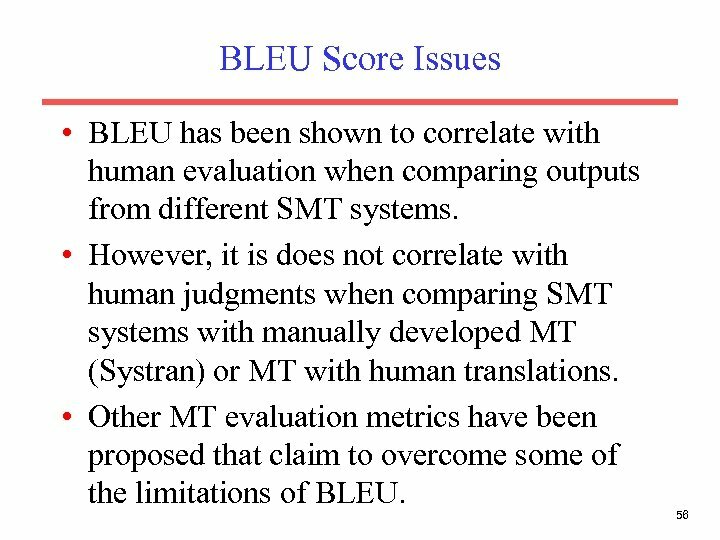 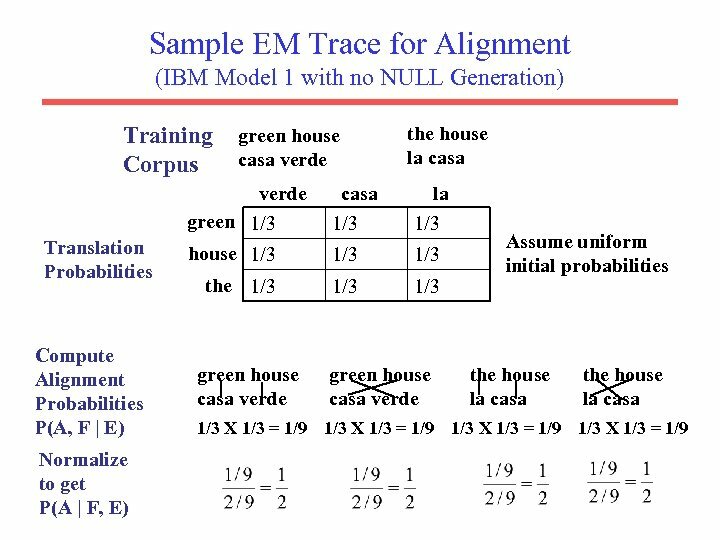 HMM-Based Word Alignment • IBM Model 1 assumes all alignments are equally likely and does not take into account locality: – If two words appear together in one language, then their translations are likely to appear together in the result in the other language. 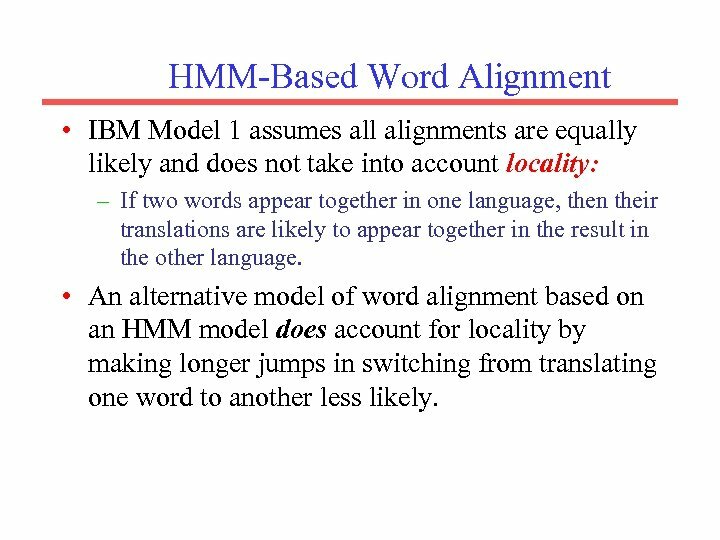 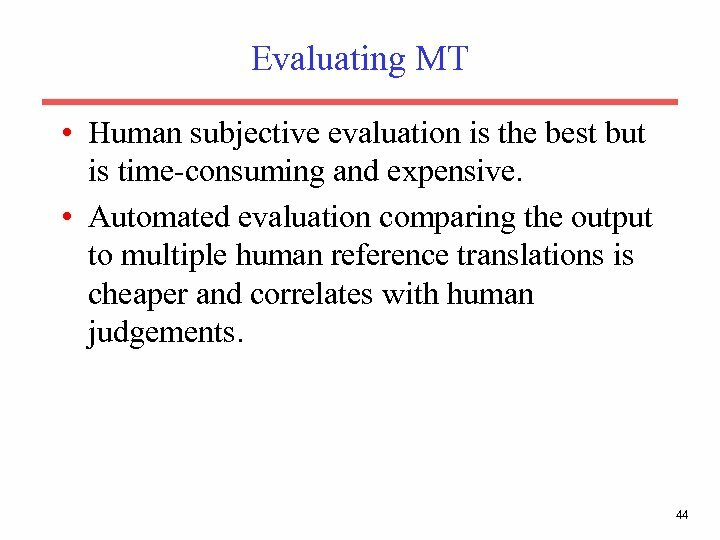 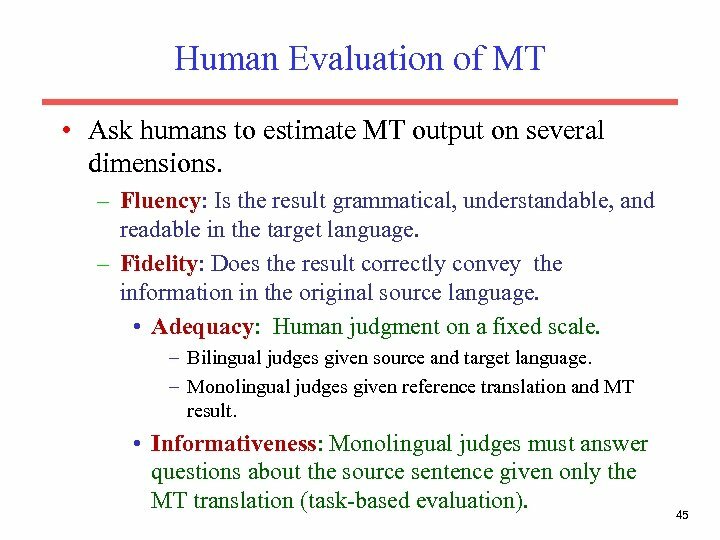 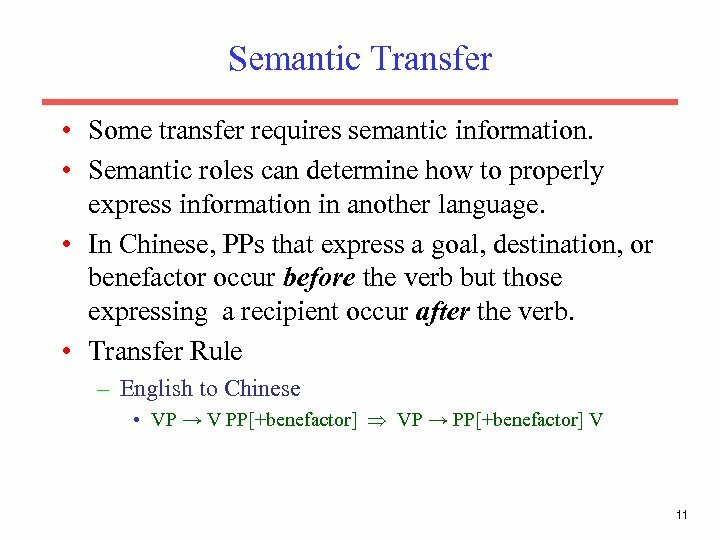 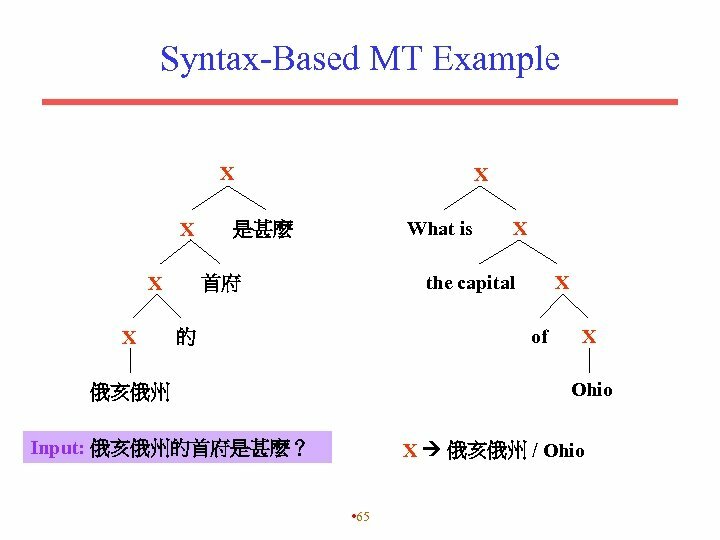 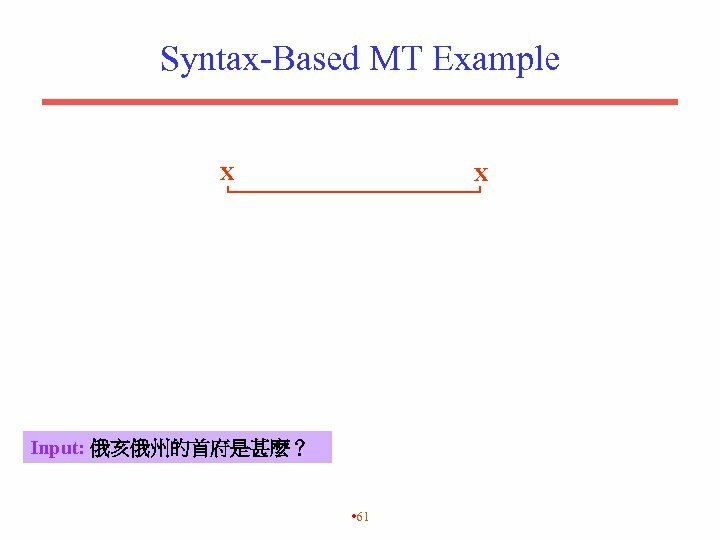 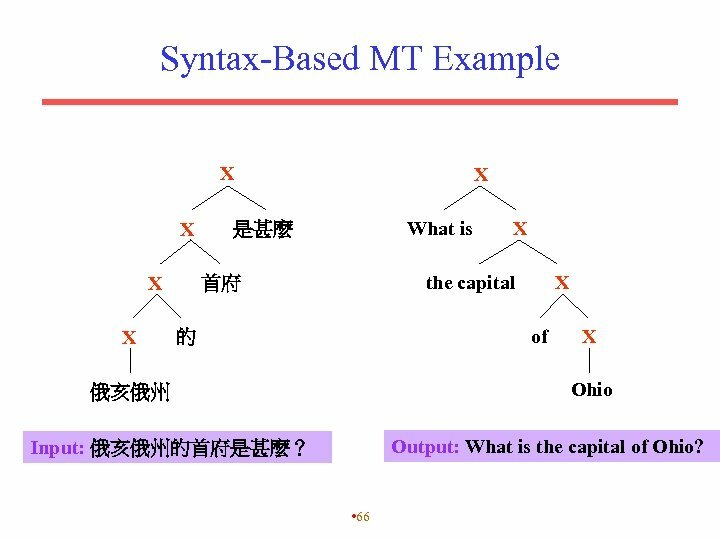 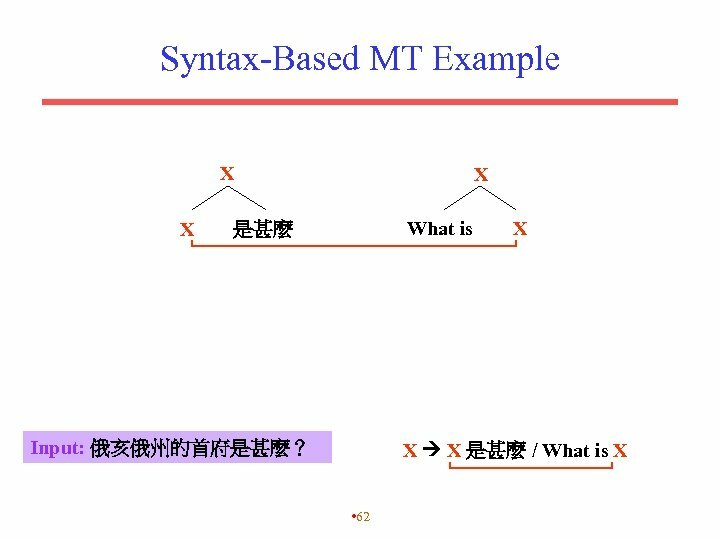 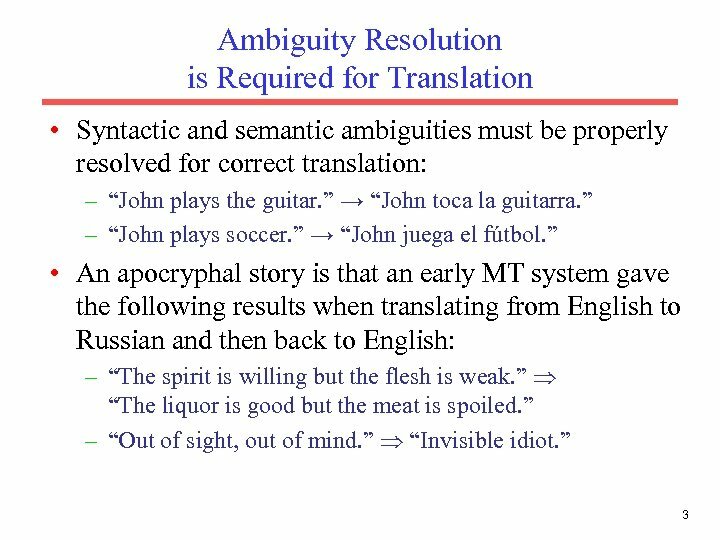 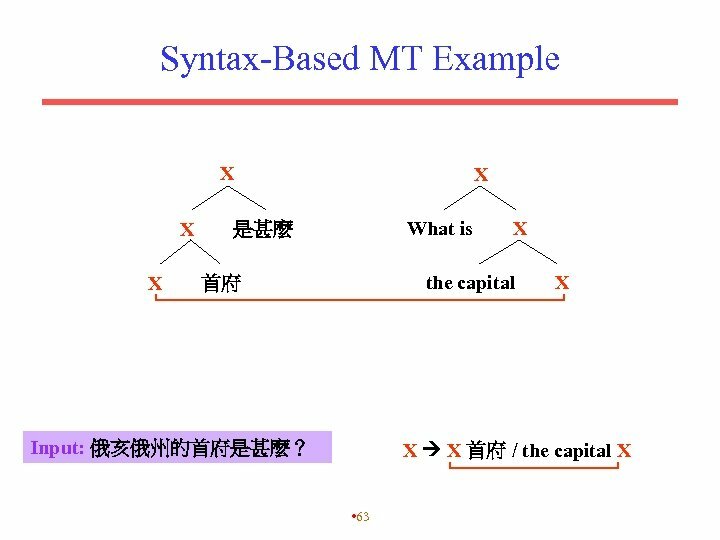 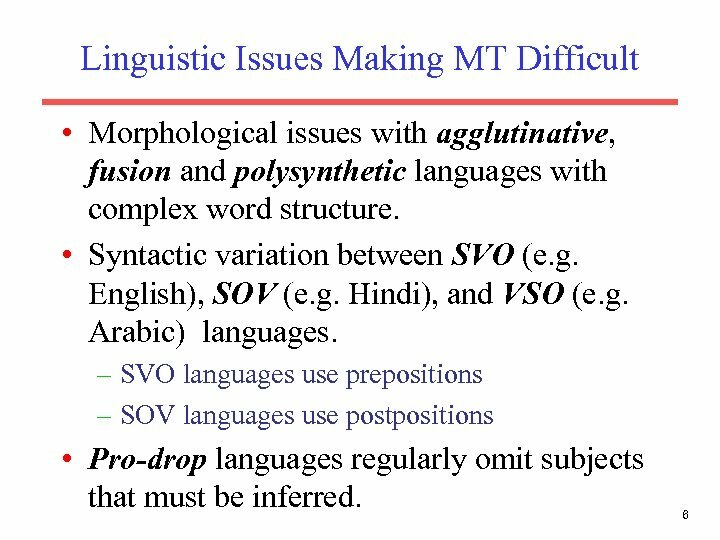 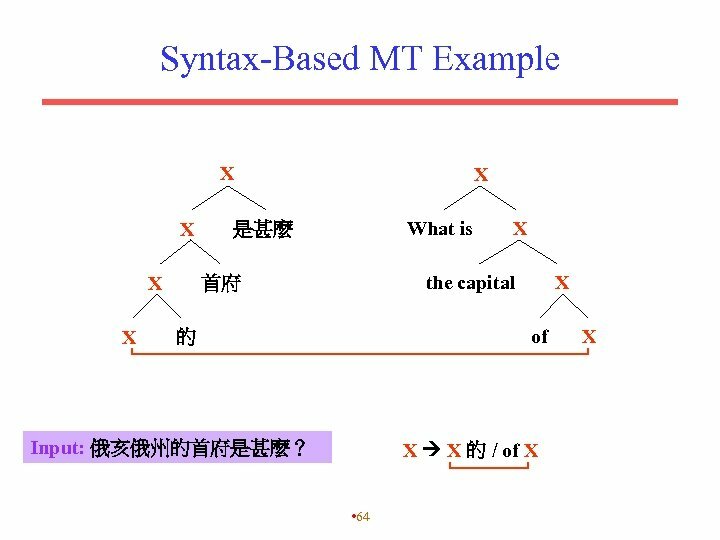 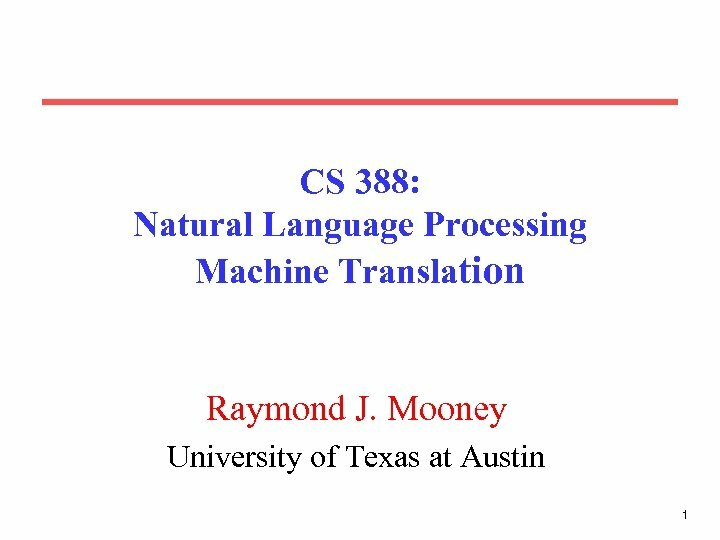 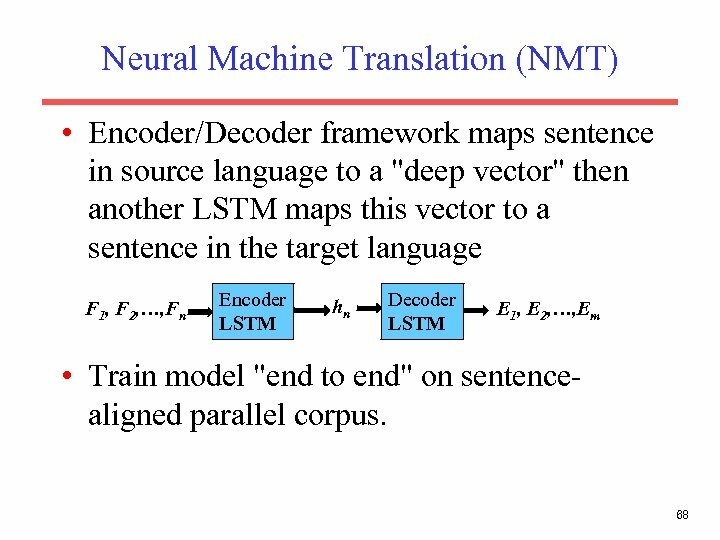 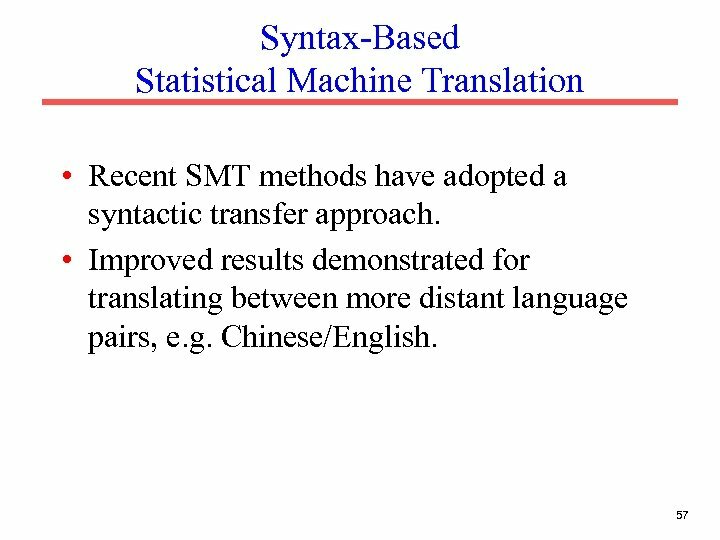 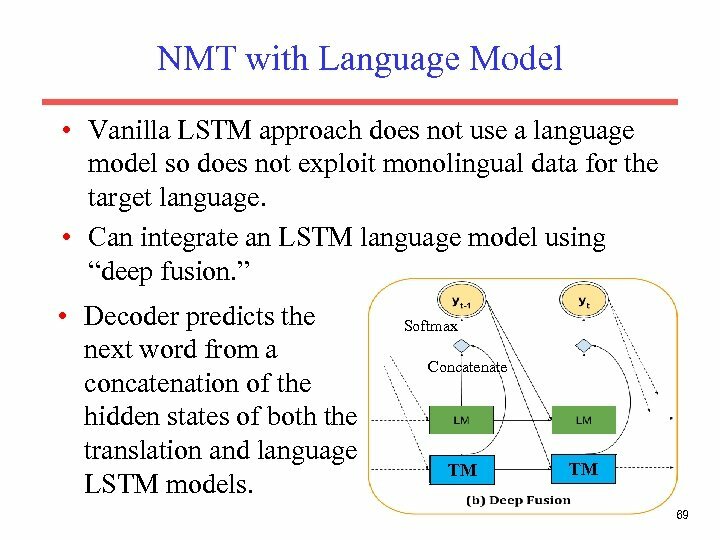 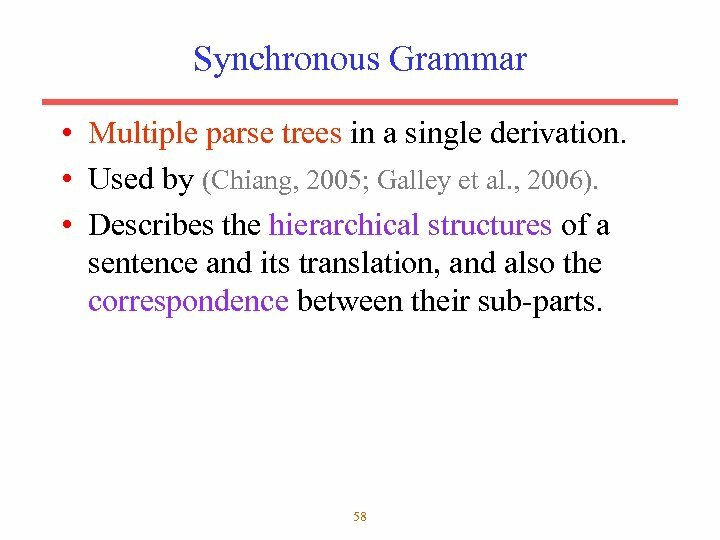 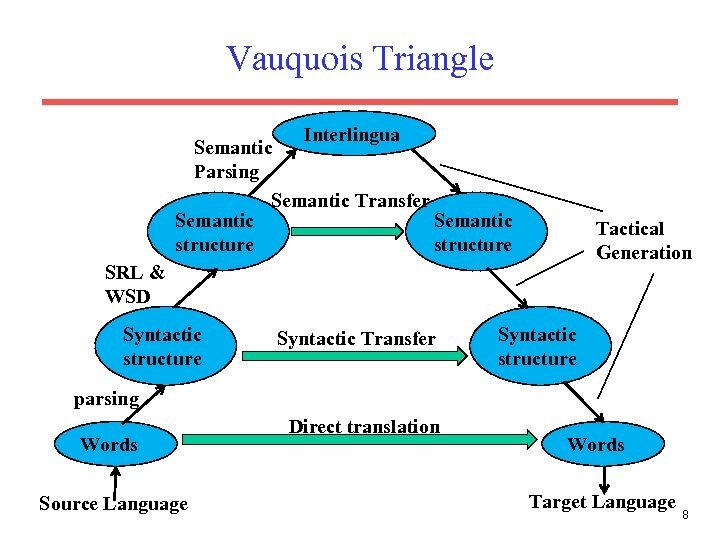 • An alternative model of word alignment based on an HMM model does account for locality by making longer jumps in switching from translating one word to another less likely. 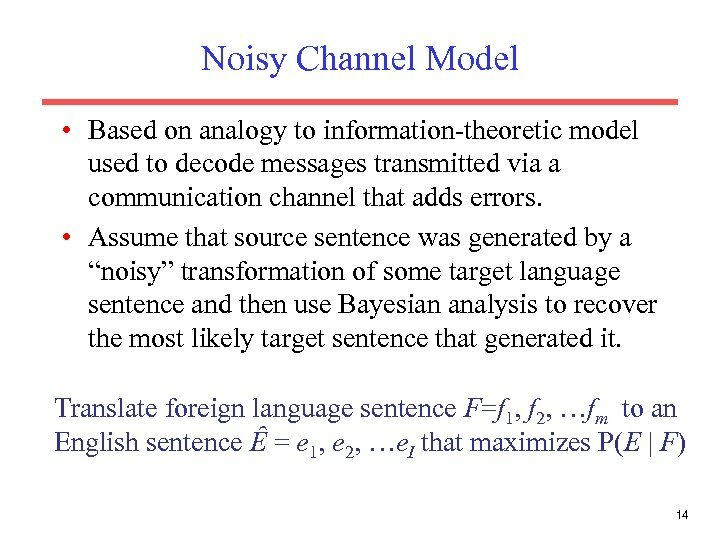 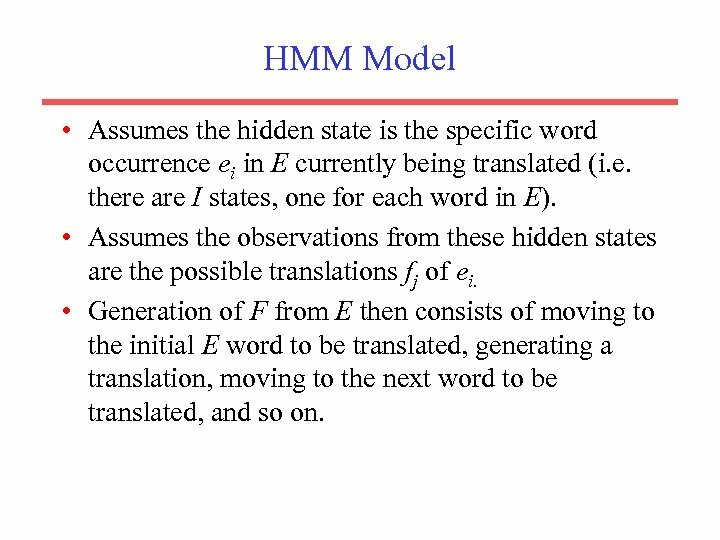 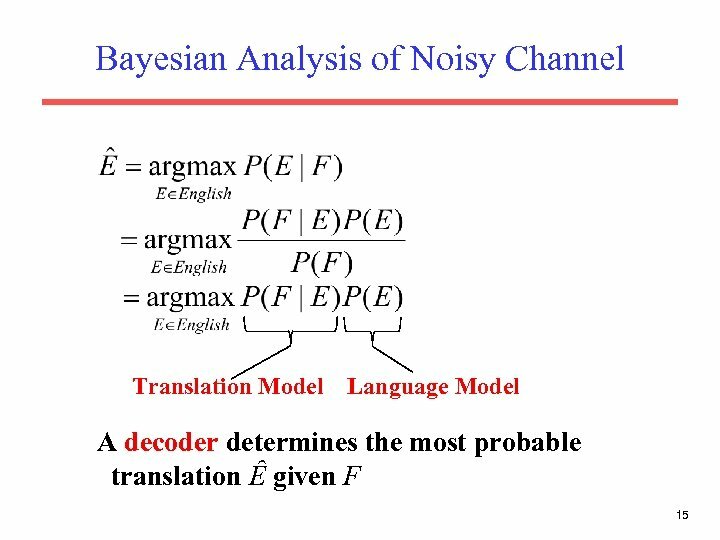 HMM Model • Assumes the hidden state is the specific word occurrence ei in E currently being translated (i. e. there are I states, one for each word in E). 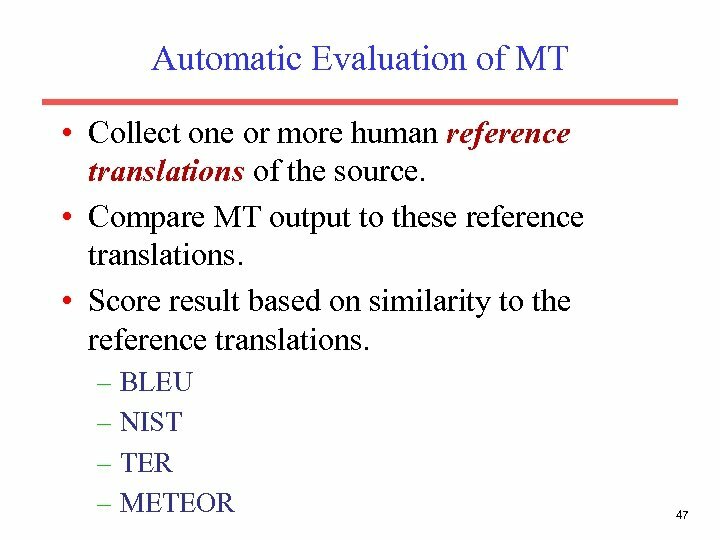 • Assumes the observations from these hidden states are the possible translations fj of ei. 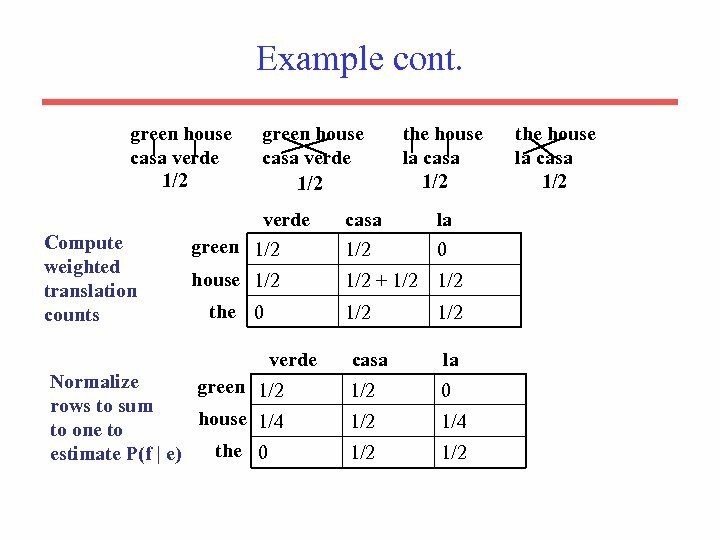 • Generation of F from E then consists of moving to the initial E word to be translated, generating a translation, moving to the next word to be translated, and so on. 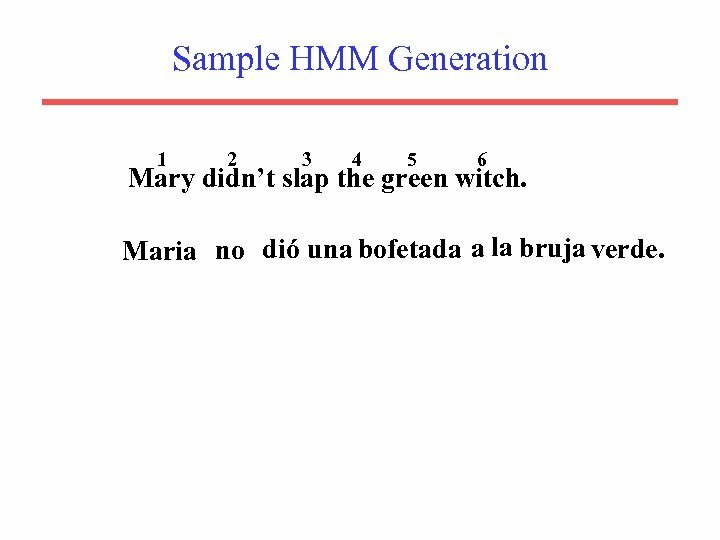 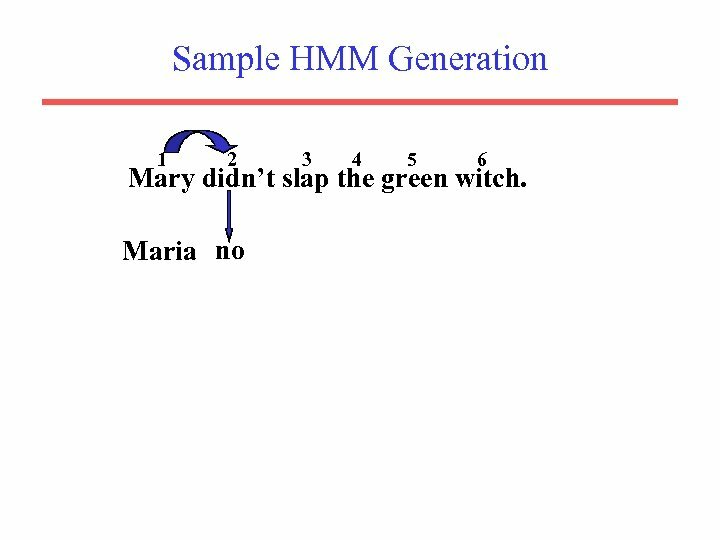 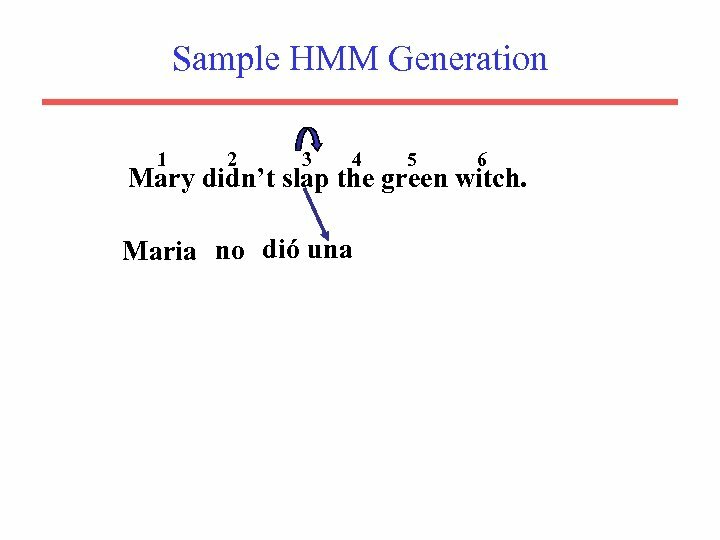 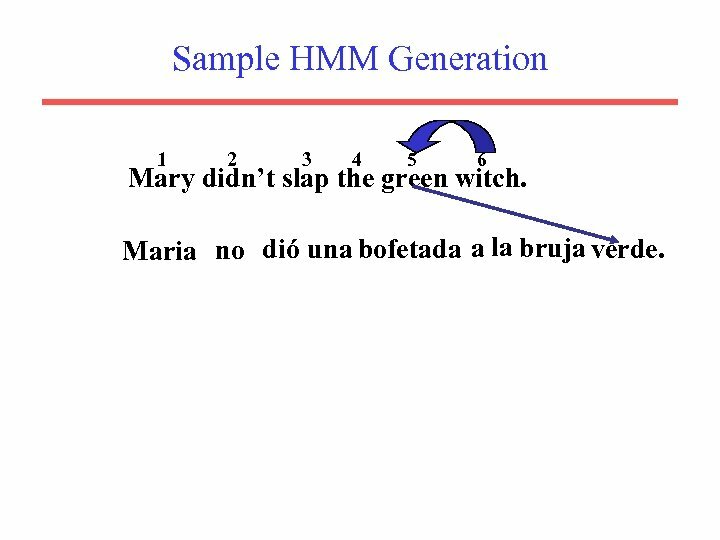 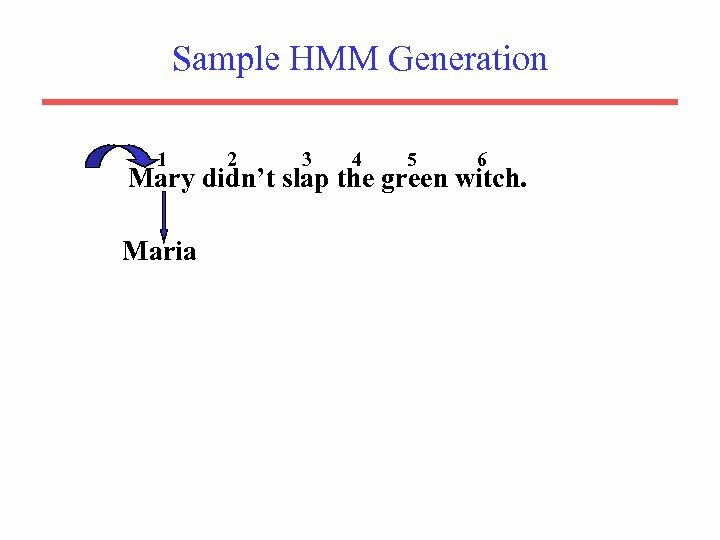 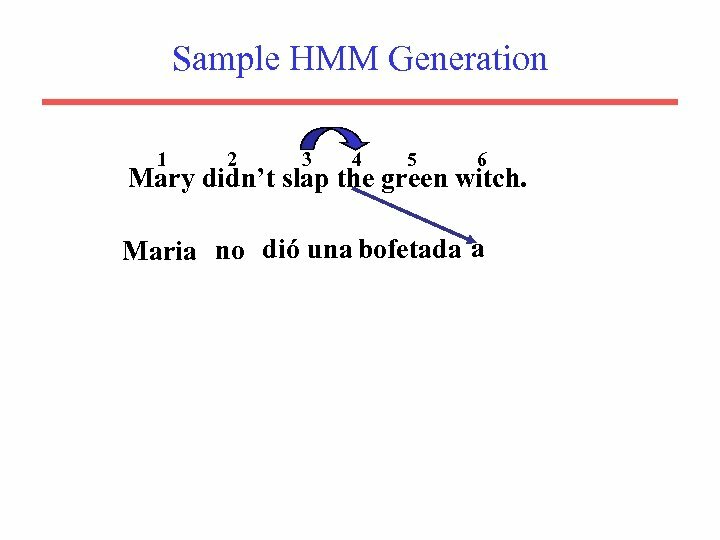 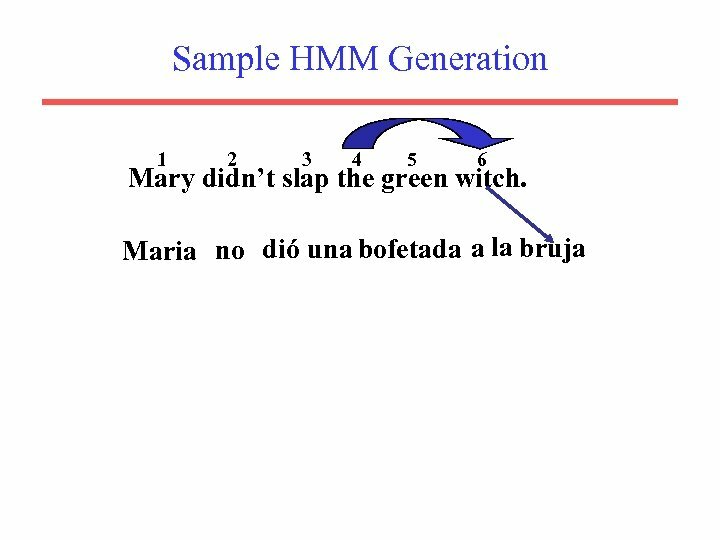 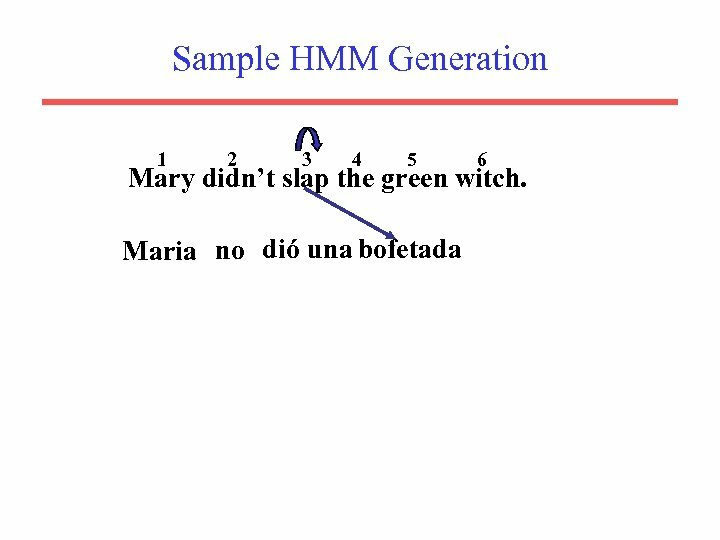 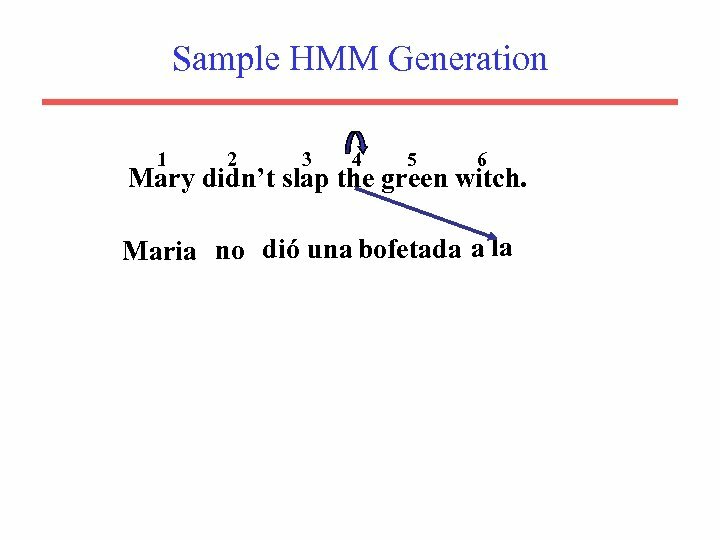 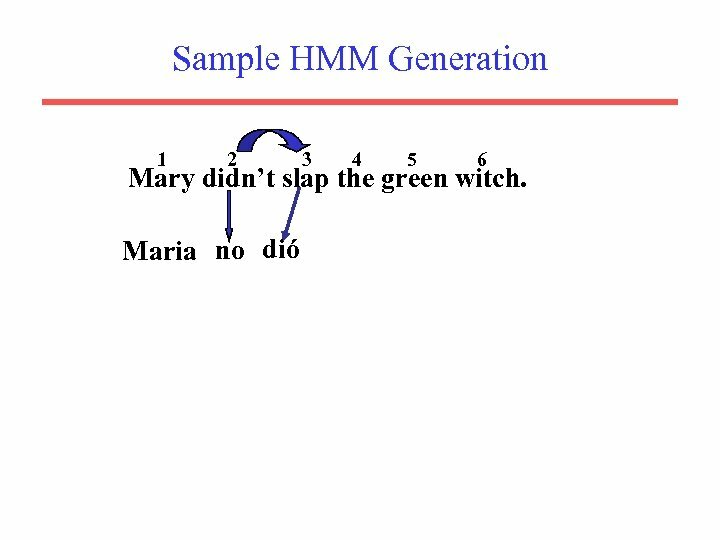 Sample HMM Generation 1 2 3 4 5 6 Mary didn’t slap the green witch. 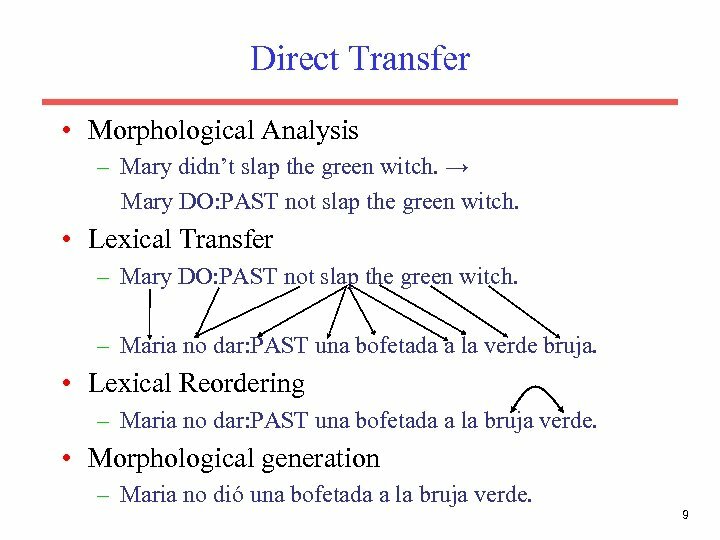 Maria no dió una bofetada a la bruja verde. 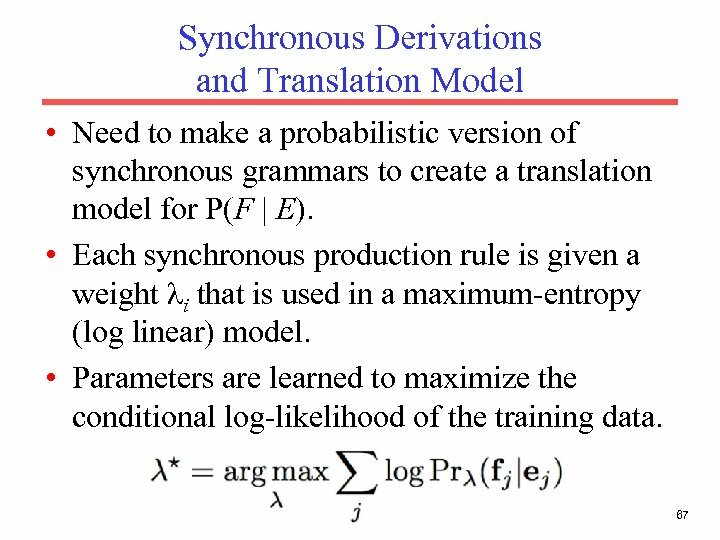 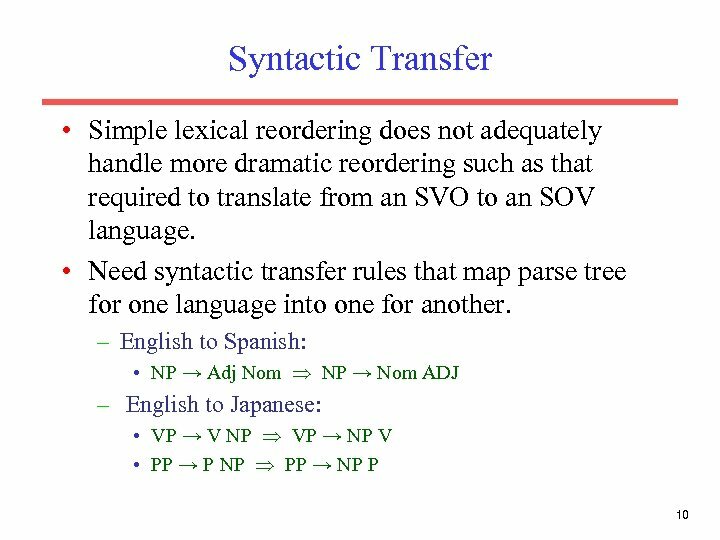 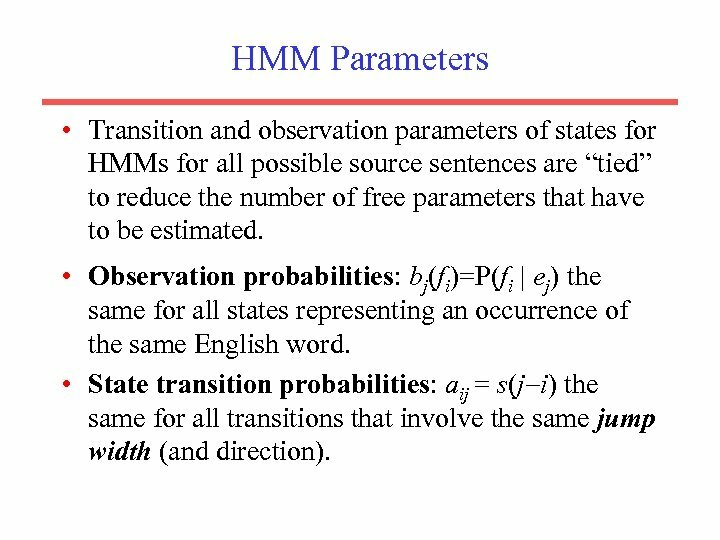 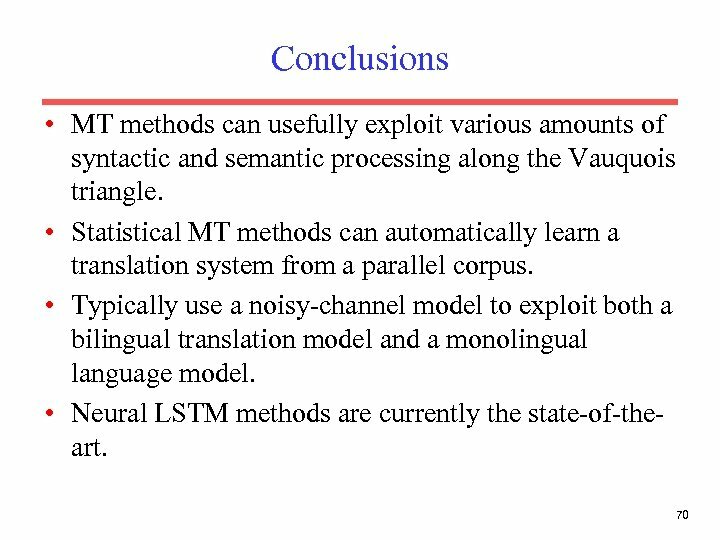 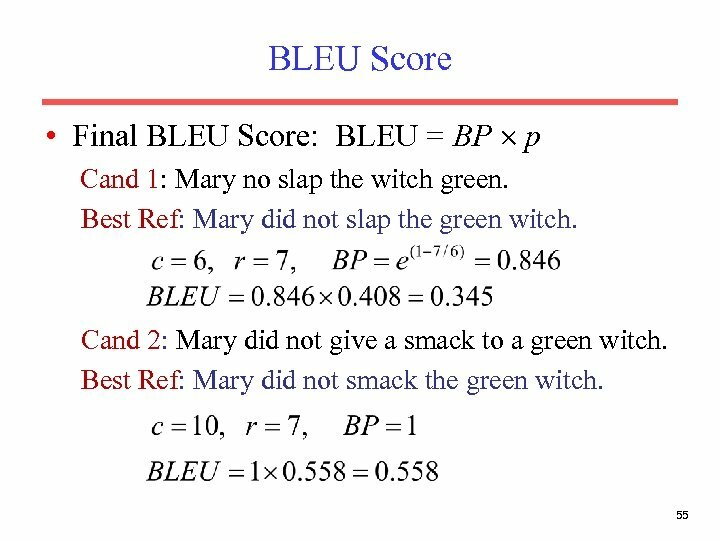 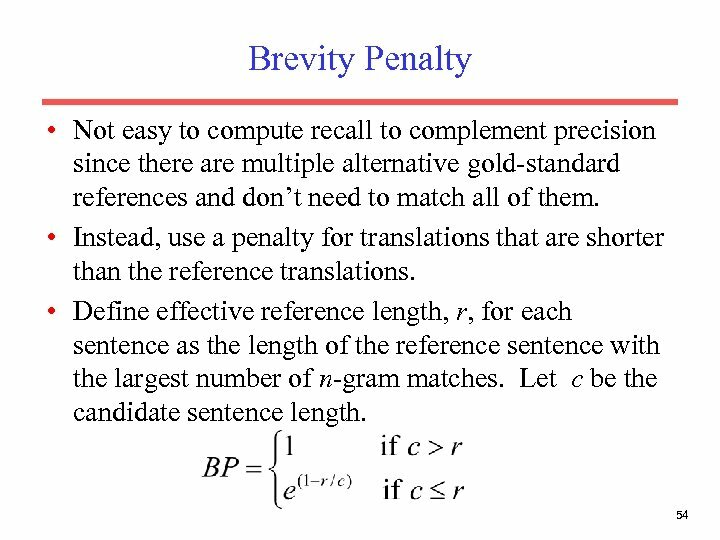 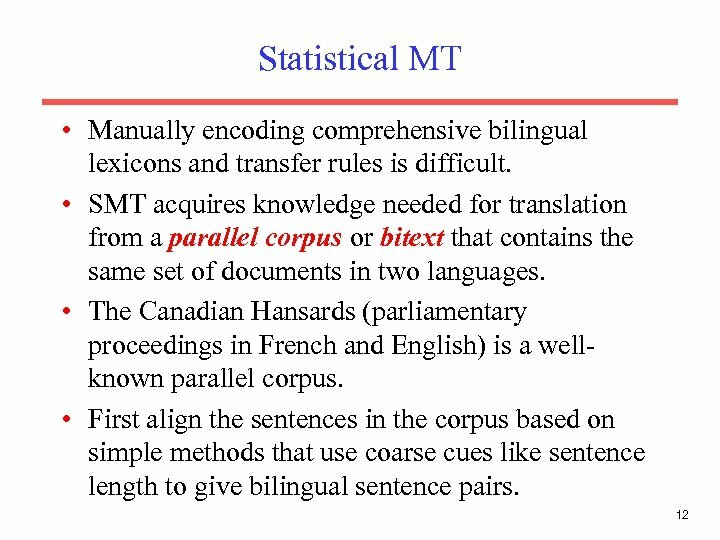 HMM Parameters • Transition and observation parameters of states for HMMs for all possible source sentences are “tied” to reduce the number of free parameters that have to be estimated. 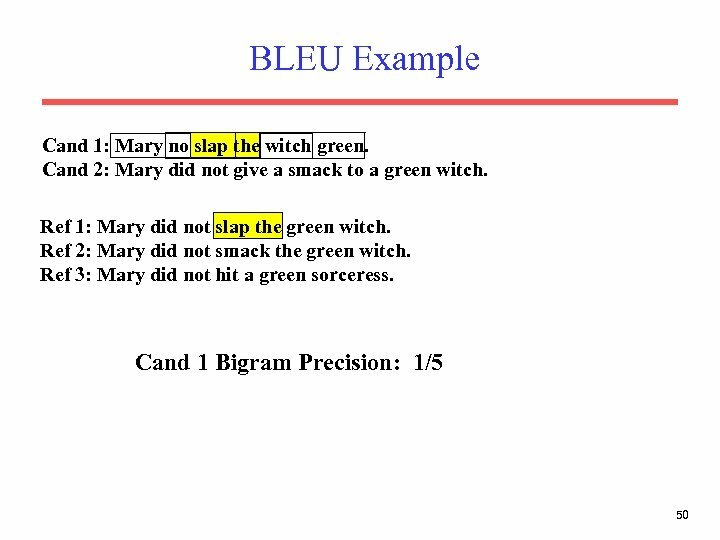 • Observation probabilities: bj(fi)=P(fi | ej) the same for all states representing an occurrence of the same English word. 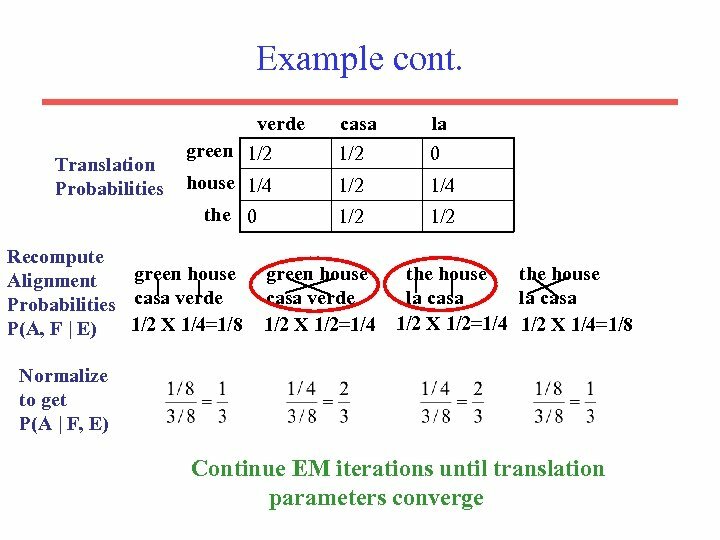 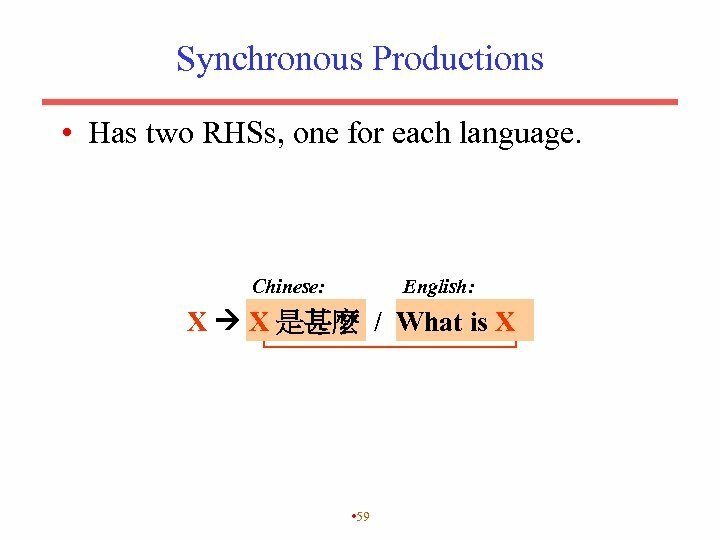 • State transition probabilities: aij = s(j i) the same for all transitions that involve the same jump width (and direction). 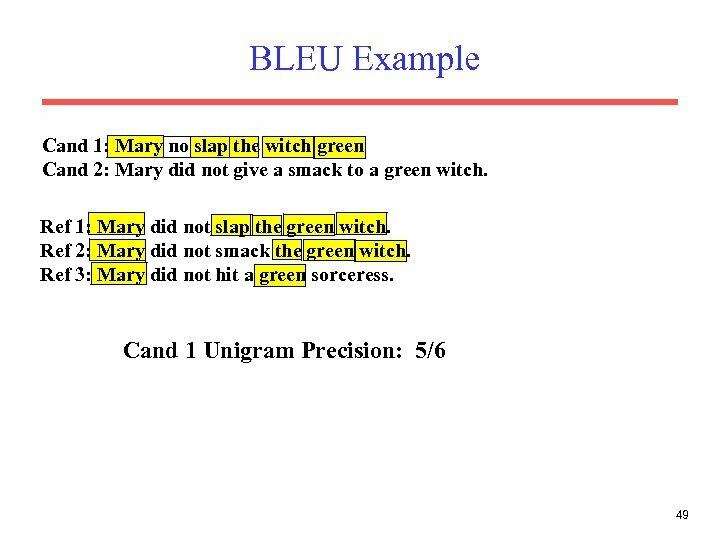 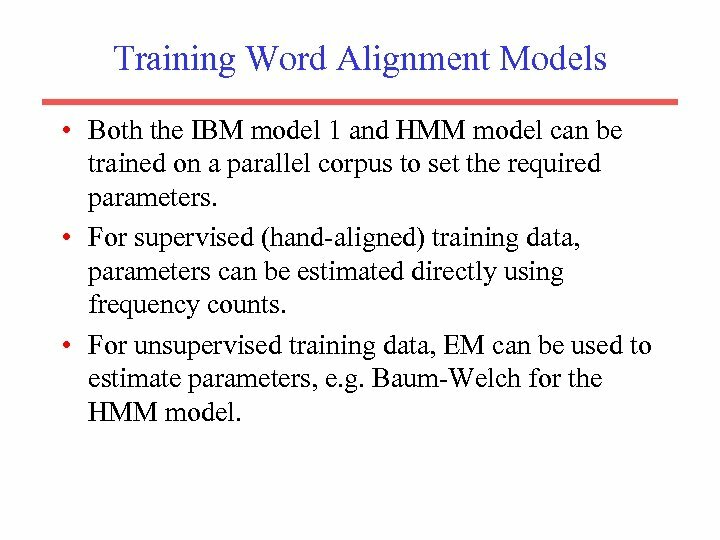 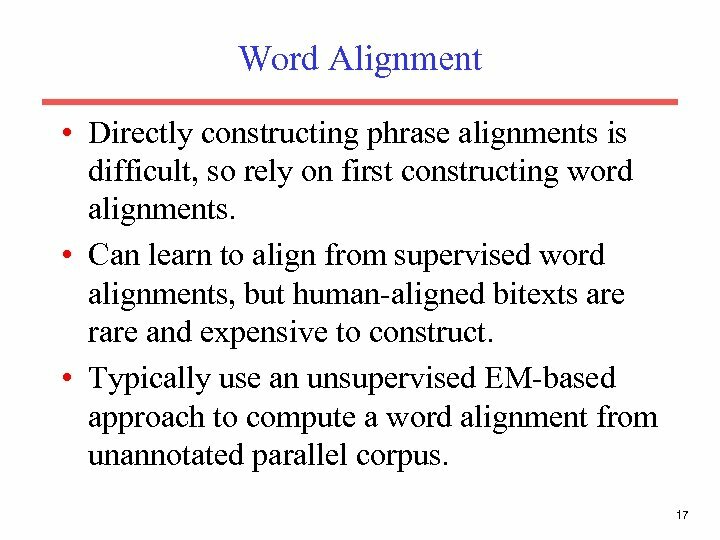 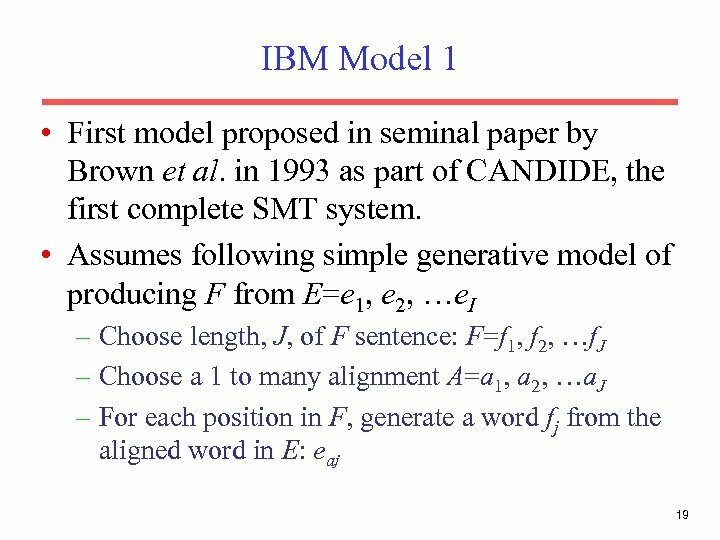 Training Word Alignment Models • Both the IBM model 1 and HMM model can be trained on a parallel corpus to set the required parameters. 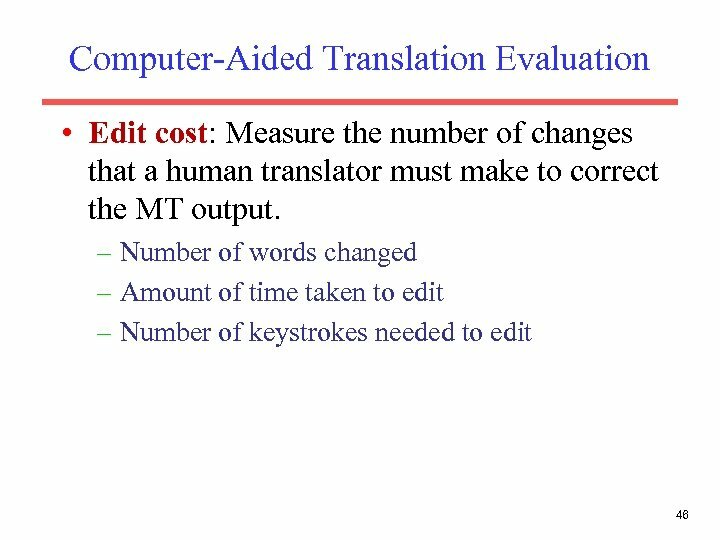 • For supervised (hand-aligned) training data, parameters can be estimated directly using frequency counts. 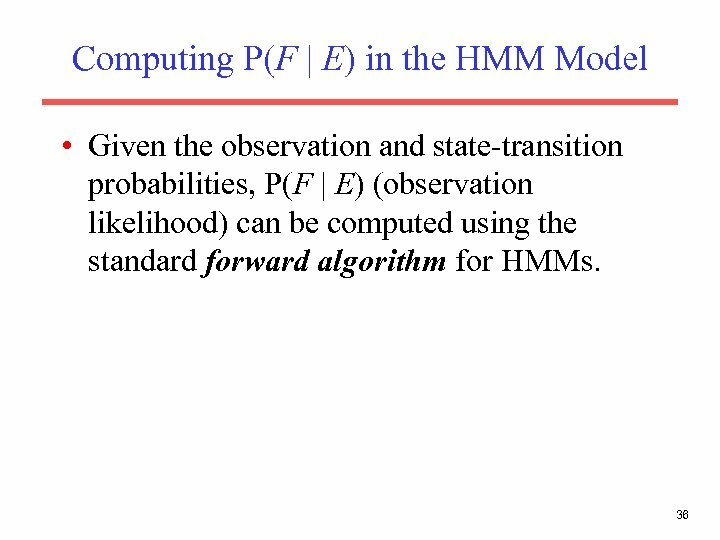 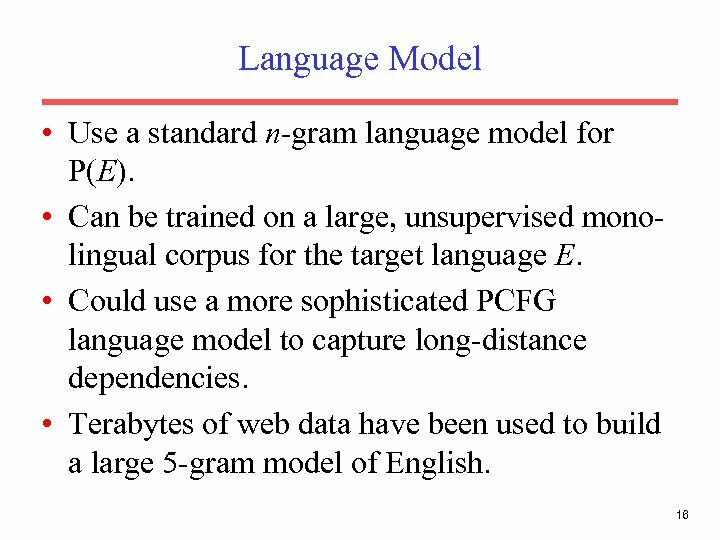 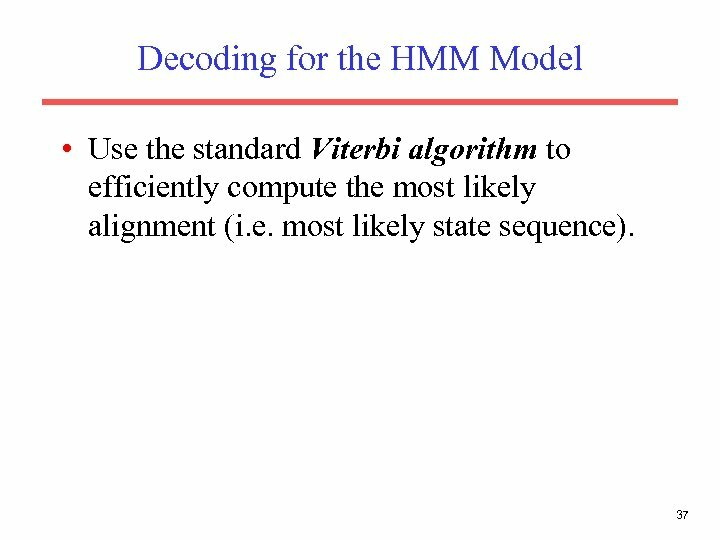 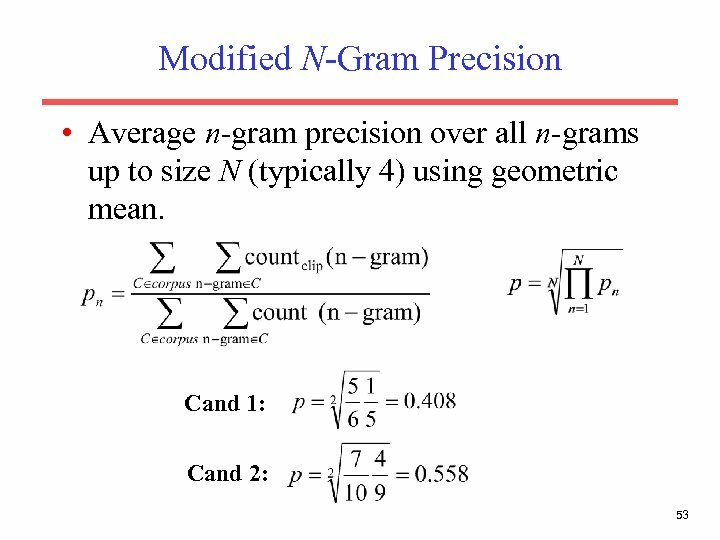 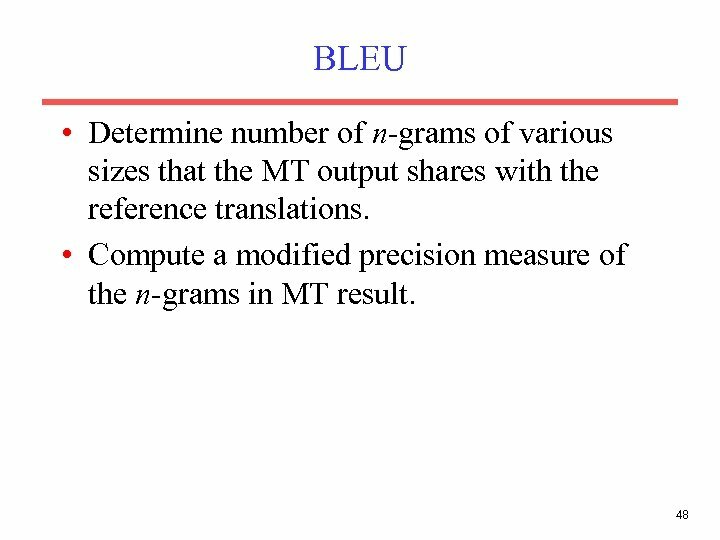 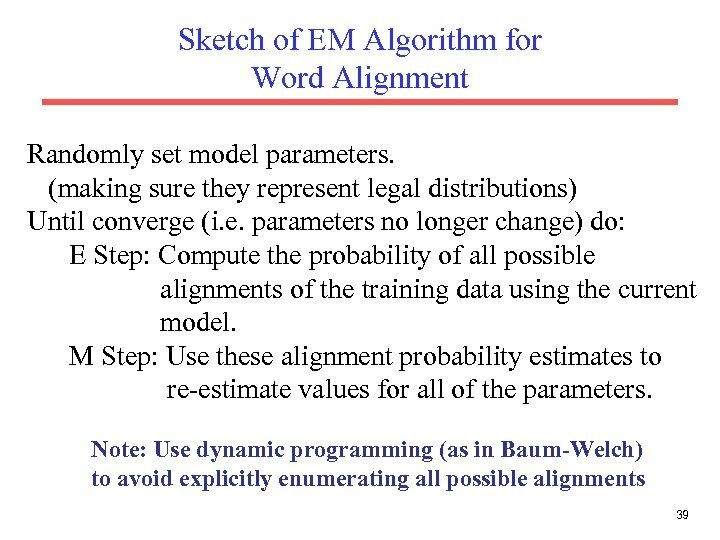 • For unsupervised training data, EM can be used to estimate parameters, e. g. Baum-Welch for the HMM model.